I didn’t read as much this last week. I finished the short story collection Lights In the Deep by Brad Torgerson, which I’d been reading for the last few weeks, a story here and there. I rate as just okay. Torgerson has some interesting ideas, but I’m not impressed by his writing. He’s an author I probably won’t read more of. I also finished Fluency by Jennifer Foehner Wells, which sounded good in reviews but I found unimpressive in reading, with clichéd plot and two dimensional characters. I’m now reading a few more short stories from various collections and Watson’s Choice by Gladys Mitchell, a book which was discussed on a blog recently, possibly for Friday Forgotten Books. It’s a slender classic mystery which I’ll finish in the next few days. Next up is an Inspector Banks novel by Peter Robinson. 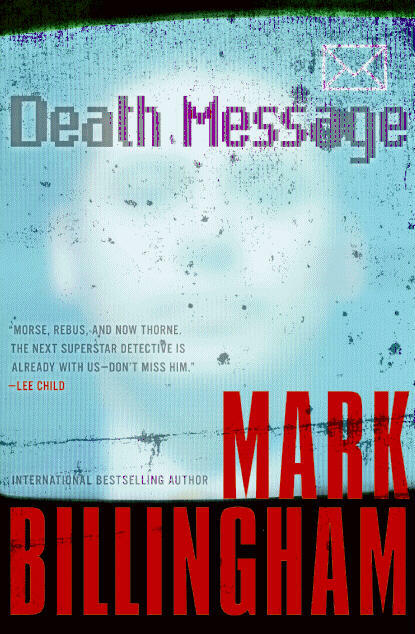 Barbara finished reading Ritual by Mo Hayder and is now halfway through another Mark Billingham novel, Death Message. She’s had a pile of things come in from the library, including a recent stand-alone novel by Val McDermid, one of her favorite authors. This entry was posted in Current Reading, mystery, short stories. Bookmark the permalink. I’m reading James Jones’ mammoth novel, SOME CAME RUNNING. It’s 1,266 pages. I’ll be reviewing it for the next FFB. When I take a break from SOME CAME RUNNING, I’m reading Neil Gaiman’s new short story colleciton, TRIGGER WARNING. Carl Anderson has already read TRIGGER WARNING and has a great review of it on his blog. Just finishing up James Morrows delightful Galapagos Regained. Also reading a collection of short stories by R.A. Lafferty. Richard, a good part of my week was spent hunkering down from the frigid winds that blasted the East Coast, Luckily, the snow passed us by. We spent one day traveling to Washington Children’s Hospital to get Kangaroo in for some routine tests. And we spent several days preparing for the Kangaroo’s adoption party that my daughter had on Sunday — out-of-town, out-of state relatives and visitors, all the food east of the Mississippi, origami kangaroos, the whole works. So not much reading this week. I’m working my way through MURGUNSTRUMM, a collection of pulp horror stories by Hugh B. Cave (and my FFB last Friday). Great fun, not necessarily great literature. I read THE SCIENCE FICTION OF KRIS NEVILLE, one of two collections Barry Malzberg and Martin Greenberg did on underappreciated SF writers for Southern Indiana University Press (the other one collected Mark Clifton stories). Neville was one of the many very good writers of the Fifties and Sixties that nave made it to the big time. The other book I read was SPECTRAL SNOW: THE DARK FANTSIES OF JACK SNOW. Snow was an occasional contributor to WEIRD TALES and a major figure on Oz fandom. Most of the stories were slight but entertaining. This coming week, more collections and anthologies. George, you’ve been working on SOME CAME RUNNING for a while now. That’s unusual for you. Are you enjoying it? I did read Carl’s review, but I’m not a fan of Gaiman. Steve, I’ve read Lafferty, but not Murrow. Jerry, sounds like it was a BIG party. Glad the snow missed you. I’m not familiar with Kris Neville. I do low Clifton, and like his writing, but Neville escaped me. I may have to look up some of his stuff. Was he primarily published in Galaxy? I haven’t read a 1000+ page book in a while. But I have this entire week off so I’m reading about 200 pages of SOME CAME RUNNING per day. Diane and I plan to see some Oscar-nominated movies this week, too. since I was off for a few days I took on quite a bit of reading. now trying to finish some stuff. George, sounds like a great week! I just don’t seem to be reading as much as I’d hoped to lately. Of course the new phone and tablet have taken up some time. I did read 18 more short stories and finished the last two short story collections I brought with me: Robert van Gulik, JUDGE DEE AT WORK: 8 Chinese Detective Stories (which I believe you reviewed a while ago) and Stanley Ellin, QUIET HORROR (originally called MYSTERY STORIES). The latter includes his first group of stories, including “The Speciality of the House.” Now it’s Kindle stories. Thanks, for the info Jerry, I’ll do a little research. Jeff, lazing about in that balmy weather may be the problem, plus all that TV watching, going to movie, gourmet dinning, walking on the beach… Sounds like you’re enjoying the new tablets, but how different can they be from the “old” ones? I’ve finished Watson’s Choice and have started Peter Robinson’s A Necessary End. WATSON’S CHOICE is the only Mitchell novel I’ve read other than the collection of short stories. I’ve read all the Peter Robinson books other than a non-series book. Jeff, I read the first two Inspector Banks novels years ago and then didn’t get back, due to other distractions. But now I have a couple, from the library and book swap, to read. Unusual choice for the WATSON’S CHOICE cover. Is it set in the 1940s? Evan, it was published in 1955, and presumably set in then current time. 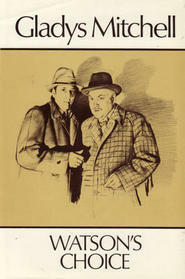 There were several other covers, this is the one on the copy I got from the library, obviously playing on the classic canon, with which the book has nothing to do other than a “Holmes party” at the beginning. With an extra long weekend (I took Friday off and had Monday off as a holiday) I have managed to get through a couple of books: Galactic North by Alastair Reynolds and Between Planets by Robert A. Heinlein. Both were very enjoyable. Well worth the time invested in reading them. Now back to The Demolished Man for the Defining 1950’s challenge.